Lakatamia K9 Academy offers the highest quality canine and handler training available on the club circuit . 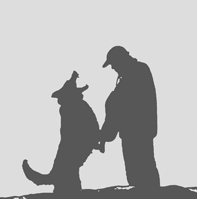 Since 1958, we have trained thousands of handlers and their canine partners. Many have gone on to the highest level of the schutzhund sport, and in all cases the Lakatamia K9 Academy has assisted members in achieving their goals. The business side of the organisation is Lakatamia International Ltd which is also dedicated to the excellence of handler and canine training. Leadership: Anthony , our founder and chairman, has worked with dogs for almost all of his life. Born in 1936 he commenced his love affair with the training of dogs at the age of 10 years, training and working his fathers wire haired fox terriers and greyhounds. On leaving School he served an apprenticeship working greyhounds for Mr. Jack Harvey at Wembley N.G.R.C) Stadium. He joined the army at 17 years as a regular soldier (Army Number 23210388) and served with the Royal Army Vet Corps 6th Army Guard Dog Unit. His service years took him to Austria, Germany, Cyprus and Egypt. On leaving the services Tony formed Lakatamia K9 Academy based in London, training many Obedience and Working Trials champions as well as specializing in all forms of Security and public Service work also working worldwide for private clients. In 1990 the Academy moved to Norfolk forming the Kennels and Training School as well as building up the Lakatamia bloodline of German Shepherds. Since 1990 'Tony' has worked on a worldwide basis specializing in explosive and drug handler and dog training. In 2006 he still is traveling throughout the world training teaching and speaking from a lifetime of experience. Trainer: Adrian, has worked with canines all his working life. Since his apprenticeship period, Adrian has worked with 1000's of handlers and dogs specializing in solving K9 problems. He has developed into one of the leading 'younger generation' trainers in the United Kingdom. His specialist fields are puppy development and protection and security training. In his 25years of working dogs he has developed his own style of working dogs with compassion in order to achieve perfection. Adrian's main interest outside of work is naturally training his own dogs to compete in Schutzhund, a sport in which he excels. Trainer / Saddler: Peter, after completing a saddlery apprenticeship, joined Lakatamia to take on the task of producing collars, leads and specialized equipment for all matters K9. He has worked in many countries for both Governmental departments and private clients organizing and completing courses in America, Africa and Germany. Peter's K9 knowledge is vast in the fields of kennel management and handler instruction. His specialist fields are drug and explosive detection as well as the production of all forms of leather equipment .